There’s more to life than the ‘world’ you live in. The life you live is conceived by your imagination. Your imagination is influenced by your experiences. In other words, the quality of the life you live is a result of your experiences, as well as the decisions you have made based on the things you know. It’s therefore important to know and experience as much as possible to live the best way you can, and what better way is there to learn about life other than by studying life itself; studying all that it’s made of, and letting the world be your teacher? 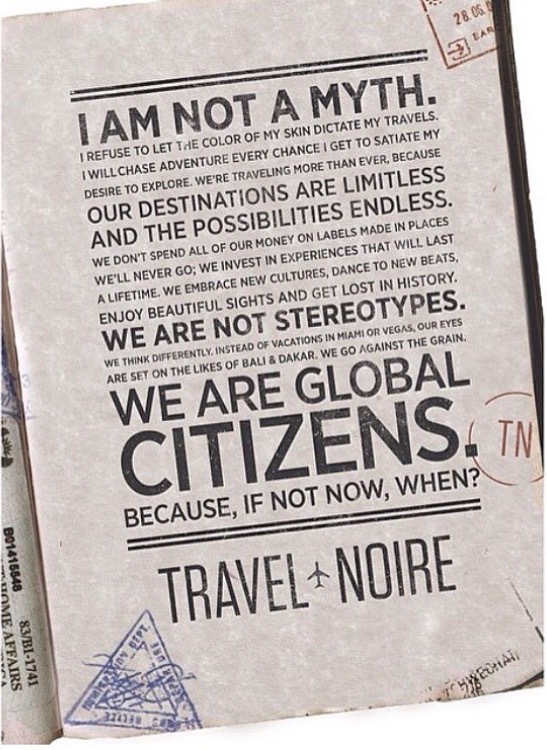 Traveling is one of the most liberating activities i’ve ever experienced. I didn’t know I was a ‘bush-boy’ until I started experiencing different cultures in other parts of the world. From then on, I decided I was going to become a citizen of the world; to be comfortable in any part of the world I find myself in. To enjoy the world. To see the world. I like traveling. It’s one of the easiest and quickest ways to enjoy new things (naturally, we all have that desire to try something new). There was a time I traveled just so I could say that I had been to this place or that place (to show off, as most people like to do). Then I grew up. I improved my mind and revised my mindset towards traveling. 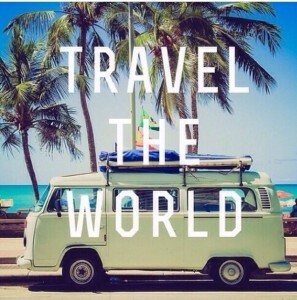 Now, I want to actually experience the world. Every trip should be an event filled with memories. It should be an experience; better shared with a friend, best with a loved one. Don’t just travel leisurely because you can, travel because you are looking to enrich your life experience. At the end of the day (or life), if you have a moment to reflect on your journey on earth, it’s these experiences, as well as your relationships, that you’d look back upon rather than the material possessions you had. They say travel is the only thing you buy that makes you richer. You’d have to truly experience it to understand. I’d share an experience with you and also tell how it changed me. First time I found myself overseas, I had what you’d call a culture shock. In this part of the world, when you eat at a fast food place, you leave your tray on the table when you are done. I had a meal at a fast food place out there, and whilst eating I noticed that people who had finished eating were actually carrying their trays, emptying the trays and placing them on top somewhere. I actually didn’t believe what I was seeing. So I said I’d observe others. I waited till I saw two more people do same and it was then I registered was what was happening. I wonder why we don’t do same thing here? Why we haven’t fully (or if at all) embraced the concept of public cleanliness. I think this practice would help somewhat in tuning the minds of people towards order and cleanliness. Traveling helps you experience other cultures firsthand. First thing to do, however, is to know why you are who you are. The cultural circumstances and forces that formed you. Then seek to know why others are the way they are, because in the process of investigation and discovery you’d have to explain who you are to others, and without knowing yourself, you’ll never learn anything in such process. I work with a lot of expats from the west and it surprises them that I know so much about their culture. I tell them I’m more American than they think I am. In retrospect, I feel silly, because it would have been better leaving them with more knowledge about myself as it relates to my ‘immediate’ culture and society rather than leaving them only with the knowledge that I know so much about theirs. Don’t be like my former self and travel because you want to be able to only just say you have traveled to this place or to that place. Travel to actually enjoy an experience. Create the experience. You may travel on a whim, or you may carefully plan your trip (with people to go and places to see), but whatever you do, travel. Go on an adventure; discover new things. Be a little bit capricious and make an unplanned trip; you’d actually cherish those experiences more than you would a planned trip. The exposure you get from experiencing other cultures is invaluable. I mean the positive experiences. We learn things by doing them repitively . Habits are formed from behaviours. Behaviours are formed from our repetitive actions. I don’t like littering. I’ve had to chastise friends who throw litter outside of car windows. I tell them to leave their rubbish on the floor mat of the car and when you get to where you are going, throw it in the trash. Why is it that countries in the western world have clean surroundings? Simple answer, it’s because they don’t litter; and the only way we can stop littering is by adopting behaviours that go against littering. Also, with punitive measures in place, I’m sure we’d stop littering. But do we need to be punished before we know what is right? It shouldn’t be that way, and with the right exposure, one would understand the importance of cleanliness and orderliness. I appreciate Lagos because of the governments conscious effort at environmental cleanliness and sanitation. Orderliness grants some type peace of mind to an individual’s subconscious such that your mind is able to operate without ‘clutter’. You are able to focus on value adding activities such as fixing social issues, thinking up new ways to do things versus only spending your life trying to grow your hustle. It’s quite expensive to travel, yes I know. But just like everything else, it’s not just one road that leads to the market. You should live within your means, and also seek to increase your means. You can start your exploration of the world by visiting neighbouring states, countries and if you have the ability, travel abroad. See the world. You’d realise that your dad’s farm is not the biggest in the world, and that there’s more to living life than how you currently do it. And for those who like to go to America or London (and please stop saying ‘yankee’ or ‘jand’) why not try to diversify the experience? When you do go to the US, take tours of different states; explore. America is not your home, so don’t go there to just sit down in the house of a friend/family, go to the mall, then go back home to sit down some more. You have an opportunity to not only improve on your lifestyle by learning new things, but with your improved cutltural experience, you can influence others and start some form of social change within your social circle. A lot of people wish to travel, but can’t ‘afford’ it. So don’t waste the opportunity you have. We are at a point where the world’s experiencing a lot of instability as a result of cultural and religious differences; all probably because of a lack of understanding of who the next person is. Also, I know it may sound impossible, but we need to find a solution to the problem of cultural mis-identity here (he’s Yoruba and so he must be this; she’s Igbo and so she must be that; he’s Hausa and so he must not lead). Those barriers need to be broken. Mindsets need to be changed. The world really is your playground. We didn’t just come to eat, pay bills, and die. There’s a lot to be learned, and much more to be done and you can only know what’s missing from you when you see what others do. As you conquer the obstacles of figuring out how to use self-help devices at airports, train stations, or depending only on GPS device on rented cars to get to your destination, etc., your development surely speeds up when you’re abroad. You will become appreciative of other cultures and even motivated to accept new cuisine. Well said sir! Thanks for the comment. Every travel experience should be used as an opportunity to learn. I enjoy travelling because I just love to pack up and hit the road or the skies as the case may be. With each destination comes a new experience, you see the world in another perspective and sometimes there is a paradigm shift. Thanks for the feedback and comment! 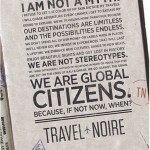 I like the line on getting a paradigm shift through travel experiences. These events help shape and define who we are in a positive way.